Mad Men? Been there, done that. Upon meeting me and discovering that I work in the field of advertising and PR, it’s really strange that a good amount of those people end up telling me how much they love the show “Mad Men” and its main character, Don Draper. They gush about it. They then ask me if I watch it. Well, I didn’t live in the hey day when the show takes place (50s/60s), but when I took my first job in 1990 at the largest advertising agency in Cleveland at the time, the mad men work/lifestyle was nowhere near extinct. I’ve only watched a handful of “Mad Men” episodes, but enough to recognize that I witnessed and experienced the tail end of that era filled with the same antics and behavior which I have seen glorified on the show. There was the drinking. Lots of drinking. I was genuinely shocked on my first day of work when my boss and our SVP took me to lunch at the Hermit Club. They ordered manhattans and the SVP tried unsuccessfully to get me to do the same. What kind of business was this, I thought? Well, I quickly learned just how acceptable and important drinking was in the industry. Typically, it was the old timers who wheeled and dealed at the 2-martini lunch. Most of us youngsters only grabbed a few beers a couple of times a week or whenever we could afford it. But it was the mad men, with their endless expense accounts, who perfected the liquid lunch as well as schmoozing, and wining and dining. By 1990, most of the quintessential “mad men” were approaching their 60s, not quite ready to retire because they were “still in the game,” or so they thought in more ways than one. There was a bar conveniently located on the first floor of our building in what had been the vault room of a bank that was formerly located there. My friends and I might grab a quick drink after work occasionally, but for the mad men, it served as an endless watering hole. To be honest, I visited that bar more during office hours. Since there were no cell phones at the time, when a client called looking for one of the mad men, we didn’t even bother looking first in the office. Instead, we immediately checked the bar. It wasn’t sad or pathetic at the time. It was just the way it was. On one occasion, I was sent to find one particular mad man, who had a very angry and unhappy client on the other end of the phone looking for him. Of course I found him at the bar “just having a few highballs.” Imagine me at 5’ 3” struggling to help a 6’ plus, 200 pound man stumble to the elevator. In heels, no less (me, not him). Oh, and don’t forget happy hour! Those guys rocked it. The famous Friday Happy Hours occurred precisely at 4:00 p.m. in the president’s office which had a fully and frequently stocked liquor cabinet. Typically, only the pretty, buxom administrative assistants were invited to mingle with the mad men. Somehow, I think I was invited once or twice. Often when I tell my stories to 20 & 30-somethings today, they find it hard to believe that these things actually happened. I can’t even remember the countless inappropriate things that were said or done on any given day. After all, the phrase ‘PC’ was not yet widespread. I sat next to my friend, another traffic coordinator. She was pretty, thin and extremely smart and efficient at her job. Oh, and did I mention she was blond? We had a blast sitting near each other and muttering sarcastic quips under our breath or rolling our eyes at the antics that never ceased to amaze us. One day close to Christmas, my friend received a call from the president’s secretary (yes, at that time the president didn’t even make internal calls). The secretary said that the president would for like her to come to his office. My friend looked scared. We imagined what she could’ve done to get herself in trouble, but we came up with nothing. In fact, we didn’t even realize he knew who she was. She trudged slowly down the very long hallway and finally into the corner office. Not even five minutes later, I see her walking back with a weird look on her face – carrying a very pretty wrapped clothing box. She had a gift in her hand from the president. “It’s a silk scarf!” I blurted out, eager to see what we knew would be an expensive gift meant for the ex-girlfriend, a 30-year-old model. “Maybe it’s a nice pair of leather gloves,” my friend said cheerfully, carefully unwrapping the box. Once the paper was off, she lifted the lid off the box; the object was blocked from my sight by tissue paper. “I can’t see it. What is it?? ?” I demanded. She said nothing. Her mouth was completely agape and she just stared absently at the box. “Oh my God,” she said as she pushed aside the tissue paper and held up a very lacy and very red teddy with black trim. All we could do was burst out laughing. But that was then, and something like that would never fly in this day and age. I hope I’m right. 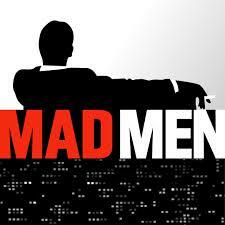 Care to share any of your mad men stories? I’d love to hear them.